The launch party’s venue may seem strange—the Koehler house is now home to the law firm of Kilmer, Voorhees, & Laurick—but it was no random choice. In fact, Ruth used the Koehler property as inspiration during the writing of Blue Thread. The protagonist of that story, Miriam Josefsohn, resides in the house with her family, and Miriam is the grandmother of Hope, the heroine of The Ninth Day. Just before she read excerpts from The Ninth Day, Ruth revealed to the crowd gathered in the majestic drawing room of the Koehler house that the historical property would again play a prominent role in the third installment in the Blue Thread series, which will be set in 2059. Also prior to the evening’s reading, Ruth spoke to the audience about her habit of dressing in period costume while reading from her texts. On the table before her, she displayed an embellished hat from 1912, the year Blue Thread is set in, as well as a pillbox hat and a wreath of flowers from the 1964, the time frame of The Ninth Day. Rather than dress as an individual from either time frame during the launch party, however, Ruth told us that she was dressed as a blank slate, embodying all three time periods featured in the series. She theatrically donned a Women’s Suffrage sash as a nod to Miriam and placed a black armband labeled FSM (Free Speech Movement) on her upper left arm in reference to the political climate of 1964 Berkley, Hope’s environment. The author completed the ensemble with a red scarf, decorated with a clock with no hands and a spider brooch, which she called her “talisman” for the third book. Thusly costumed, Ruth began her reading. Ruth Tenzer Feldman reading from The Ninth Day . In truth, to refer to Ruth’s performance with a term as simple as a reading is reductive. Despite her slight stature and kind disposition, Ruth presented the material from the book with formidable enthusiasm. The first passage, which described the return of a character from Blue Thread, Serakh, established the main plot for the book. Serakh discovers Dolcette, a woman in 1099 Paris, who is living in fear that her husband will harm their newborn child. Serakh, the wise time raveler that she is, knows that she must connect with someone from Miriam’s line and bring her to help Dolcette’s. The second section read by Ruth was every bit as evocative, this time regarding the life of the protagonist, Hope. Hope is a shy sixteen-year-old who suffers from a stutter that only subsides when she is singing. In the passage Ruth read, Hope is witness to two powerful occurrences at a FSM rally at University of California, Berkeley. The first is a passionate speech given by Mario Savio, leader of the free speech movement. Savio is a fellow stutterer, and yet when he speaks publically, his impediment is not at all apparent. Secondly, Hope sees a moving performance given by Joan Baez. The succession of the political leader overcoming his personal obstacles to stand up for a larger cause and the freedom expressed in Baez’s concert told the audience a great deal about Hope’s impending journey. 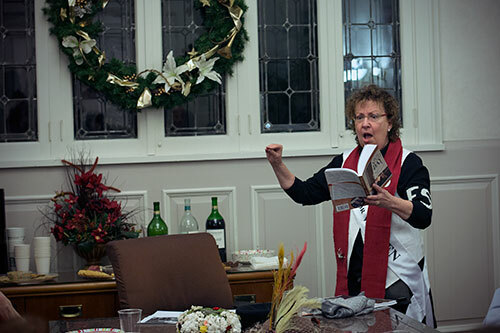 Throughout the reading, Ruth’s charming personality engaged the audience. The launch party for The Ninth Day was entertaining and thoroughly enjoyable, due in equal part to the amiable personality of the author and the grand yet charming atmosphere provided by the Koehler house. Good wine, tasty snacks, and an interesting story combined with enticing hints of things to come in the Blue Thread universe rounded out the evening, which proved to be time well spent.